Earlier this month, newly declared Psychology majors attended the New Majors Orientation and “officially” signed in to the department! If you are a newly declared Psychology major and you have not attended an orientation yet, be sure to lookout for New Majors Orientation dates this upcoming Fall 2019! On Tuesday, February 5th in Fintel Library as part of Psi Chi’s Q&A, Beth Macy, author of Dopesick, spent some time answering questions and talking with students and faculty. Snacks and drinks were provided. The video encapsulates the event, but read on to learn more from Dr. Angela Allen’s perspective. Beth Macy, the author of the 2018 nonfiction book Dopesick, visited the Roanoke College community for several days in early February. Dopesick is a compelling read about the impact of opioid addiction in several communities and the struggle of those who try, often repeatedly, to cease use. Much has been written about addiction, but this book really brought home the human impact and reminded the reader that the addicts are sons, daughters, parents, siblings who are loved and valued. The book also illustrated how frustrating the treatment process is for the users and their families, especially given that medication-assisted treatment has demonstrably the best outcome but yet meets with a great deal of opposition from many quarters. As a mom myself, I really felt for the parents of users who loved their children and wanted to help them, yet often found themselves overwhelmed and feeling helpless in the process. Beth met informally with a group of our psychology students on February 5. She presented a heartfelt account of the opioid crises and how it has impacted the lives of so many Americans. She spoke about the fact that opioid addiction is something that can and does happen to people from every background, illustrating this point with stories of a young local woman from a well-off family who became addicted after taking opioids medicinally and ultimately met a tragic end. She spoke passionately about how misconceptions of addiction and of medication as treatment for addiction are limiting the options for people who are addicted, and that it is often literally a life or death situation. Students asked her what they could do to help, and she talked about being politically involved, educating people about medication as a treatment for addiction, and even learning how to carry and use the opioid antagonist Narcan. My own students later commented that they had not realized how difficult treatment can be to access and that drug courts and needle exchanges could have real benefits to users as well as the communities around them. While reading about these addiction and treatment is very informative, it was a great experience to hear directly from Beth and to be able to ask questions. It would be fantastic if the community can use the information from this experience to improve the lots of users and their families. 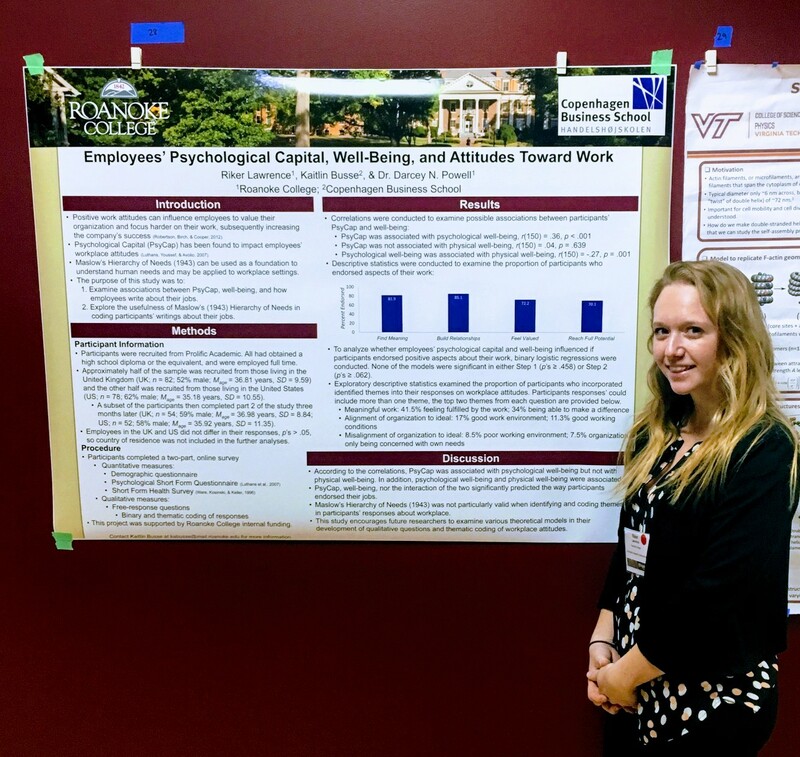 Several psychology students were recently able to present their research at the psychology poster session on December 7th. There was plenty of pizza and drinks for everyone. Great job presenting and thanks to everyone that came! Interested in internships? Then join us on Thursday, November 2nd, from 11:45 to 1:00 in Life Science 502 for an information session to learn about the different opportunities available, as well as their requirements and deadlines, and much, much more! On Saturday, October 7th, 2017, Roanoke College hosted an Out of the Darkness Suicide Prevention Walk. Students, professors, locals, and students from other universities all participated in the walk. Thank you to everyone who came on Saturday! On Saturday, October 7th beginning with registration at 10 am in the Cregger Center, Roanoke College will be hosting the Out of the Darkness Community Walk to help fight suicide. Following registration, the walk will start at the back quad beginning at 11 am. If you would like to participate in the walk, then please register today through the link in the flyer. RCPA and Psi Chi Students will also be there to help support the event and the American Foundation for Suicide Prevention. This event is part of Mental Health Awareness Week sponsored by Roanoke College’s Student Health and Counseling Services. Other activities hosted this week include a Suicide in the Media Discussion Panel on Tuesday, Oct. 3 from 6:30- 8 pm in Massengill Auditorium which is open to all, followed by a Mental Health Education Fair and Free Depression Screening Event on Thursday, Oct. 5th from 5-7 pm in the WELL (Alumni 216). For this latter event, students can call Student Health and Counseling Services (540-375-2286) to schedule a screening or they can drop-in. Screenings are confidential. If you’re interested in any of these activities and want to learn more, there will be a table set up on Monday (10/2) and Wednesday (10/4) outside of Commons where information will be provided and ribbons for Mental Health Awareness will be given out.